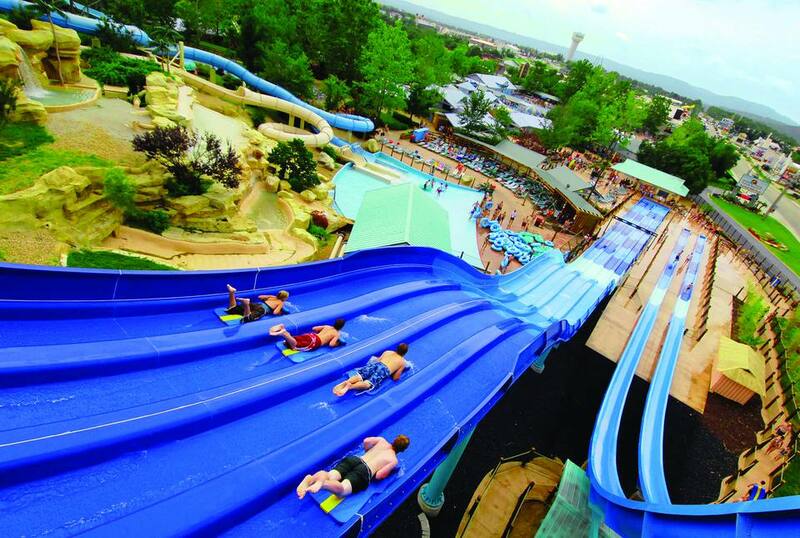 No matter the season, you'll find water slides to ride in Missouri. In the warmer months, especially when temperature and humidity levels rise to ridiculous levels, nothing provides quite as much relief (and a ton of fun) as a day at an outdoor water park. In the colder months—and all year long—indoor water parks offer climate-controlled lazy rivers, slides, wave pools, and other attractions to enjoy. Aquaport is a small, municipal, outdoor water park with an adult leisure pool, a kiddie area for smaller children, five water slides (including a bowl ride), and a 750-foot lazy river. The Bay is a medium-sized, municipal, outdoor water park. Features include a surf simulator, a lazy river, a bowl slide, a play pool, and a water play center with a tipping bucket. This medium-sized, outdoor water park features a wave pool, the Zambezi Falls half pipe raft ride, a bowl ride, a lazy river, an activity pool, and a kiddie area. Big Surf is located near Lake of the Ozarks. The Indoor water park is relatively small. Attractions include body slides, tube slides, a lazy river, kiddie slides, an indoor/outdoor whirlpool spa, an activity pool, and an interactive play structure with tipping bucket. In warmer weather, Castle Rock offers an outdoor splash pool, a wading pool, and an activity pool. The water park is open to registered hotel guests as well as to the general public. Admission to the park is bundled in some of the hotel fees. CoCo Key is a medium-sized indoor water park with body slides, a raft slide, a lazy river, a wave pool, kiddie slides, an indoor/outdoor whirlpool spa, an activity pool, and an interactive play structure with tipping bucket. The water park is open to registered hotel guests, and day passes are available for non-hotel visitors. Hurricane Harbor is a huge outdoor water park that is located adjacent to and included with admission to Six Flags St. Louis. Attractions include the Bonzai Pipeline looping slide with launch chambers, a family raft ride, a lazy river, a wave pool, speed slides, a funnel ride, a mat racing slide, and activities for younger kids. Hydro Adventures is a family entertainment center that includes a small outdoor water park with water slides, a wave pool, a lazy river, and an activity area for younger children. There are also "dry" rides and attractions, including mini-golf, go-karts, and batting cages. Indoor activities, including a redemption arcade, laser tag, and bowling are open all year long. Mark Twain Landing is a small outdoor water park located next to a campground. Attractions include a wave pool, water slides, and a lazy river. The facility also features go carts, trolley rides, bumper boats, and miniature golf. Oceans of Fun is a huge outdoor water park that is located next to and included with admission to Worlds of Fun theme park. It features many water slides, a wave pool, an interactive splash pad, an interactive water play center, multiple play areas for young children, and a lazy river. The Grand Country resort includes the small Splash Country indoor water park. Attractions include an interactive treehouse water play structure, two tube slides, a lazy river, an activity pool with water basketball, and a pool for younger children. In warmer weather, the park also offers some outdoor water park fun with more slides and attractions. Splash Country is open to the public and to Grand Country hotel guests. Part of the Tan-Tar-A Resort, Timber Falls is a small indoor water park. Its attractions include water slides, an activity pool, a whirlpool, a lazy river, and an interactive water play structure with slides, bridges, water blasters, tunnels, and a tipping bucket. White Water is a large outdoor water park that is located near and operated by the same folks that run Silver Dollar City theme park. It requires a separate admission. Attractions include a lazy river, a mat racing slide, speed slides with launch chambers, a family raft ride, a wave pool, body and tube slides, and activity areas for younger visitors.